1. An average price option is a cash-settled option whose payoff is based on the difference between the average value of the underlier during the life of the option and a fixed strike. 2. An average strike option is a cash settled or physically settled option. It is structured like a vanilla option except that its strike is set equal to the average value of the underlier over the lifeHow is it constructed? Premiums are paid in advance. Due to the reduced potential for the buyer to receive a large payoff, they cost less than a corresponding vanilla option. Can be structured as both American and European options. 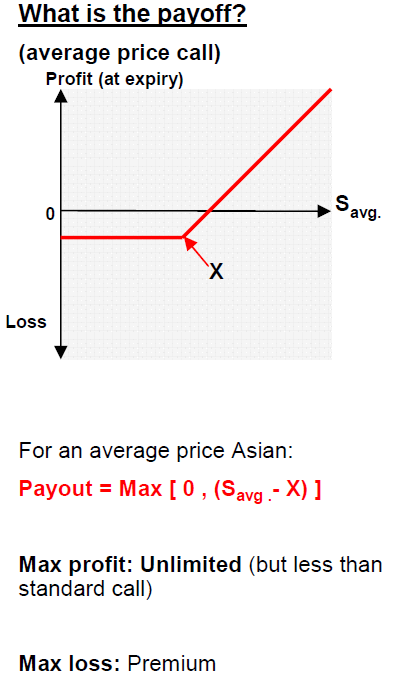 The averaging feature can be applied throughout the entire life of the option, or for a period of time at the beginning and/or end. They were originally used in 1987 when Banker’s Trust Tokyo office used them for pricing average options on crude oil contracts; and hence the name “Asian” option. They are commonly traded on currencies and commodity products which have low trading volumes. End-users of commodities or energy related products tend to be exposed to average prices over time, so Asian options are attractive for them. Asian options are also popular with corporations, such as exporters, who have ongoing currency exposures. They tend to be less expensive—sell at lower premiums—than comparable vanilla puts or calls. This is due to their lower levels of volatility making them cheaper. As a rule of thumb they are generally cheaper than their European counterparts. The averaging feature can be applied throughout the life of the option, or at the beginning, and/ or at end, and therefore the cost of the option can be tailored to investor needs.